In a previous life, The Well House was used for storing and drying the hops that were grown in the fields close by. Hops are still grown locally – check out the beer from the Wye Valley Brewery! 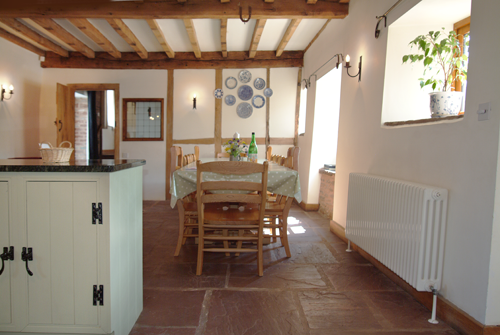 The original half timbered barn has been sympathetically restored with oak flooring and exposed beams throughout. Ceilings are high and rooms are light and airy. As you step into the hall, you are aware of the sense of space and light. THE SITTING ROOM Relax and sprawl …stunning space with exposed beams and an inglenook fireplace with a Clearview wood-burner (they don’t get better!) Curl up … large sofas and wing backed chairs…oriental rugs on the oak floors …watch TV, read, socialise. 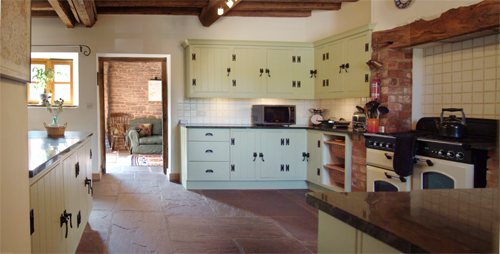 KITCHEN/DINING AREA Socialise… The kitchen is equipped with everything needed for serious entertaining. The dining area is dominated by the splendid oak table which comfortably seats 12 adults with space for a few small ones. SIX BEDROOMS provide accommodation for 12 adults plus 3 extra small people! All beds are from Feather and Black ™ and are complemented with luxury non allergenic duvets … Snuggle! BEDROOM 1 master/family room containing super king bed and large ensuite with freestanding bath. A comfortable sofa bed accommodates two younger family members. BEDROOM 2 two single beds (can be linked to make one six foot bed). BEDROOM 3 king sized bed. BEDROOM 4 king sized bed, ensuite walk in shower. BEDROOMS 5 & 6 are at the other end of the house, beyond the large sitting room, each providing two single beds. Bedroom 5 also contains a roll away bed for added sleeping space. Free WiFi. Most bedrooms have an ipod docking station. Four bedrooms have TVs. OUTSIDE There is parking for about six cars at the front of the house. At the back there is a lovely lawn and patio for morning coffees, afternoon tea, and alfresco pre-dinner drinks. The local cider goes down particularly well while tending the large Weber© barbecue! Vehicles may back right up to the front door for off loading. Three ground floor rooms entered by way of a few steps. Grab rails are provided at each of these locations. Kitchen counter tops are all standard height and are therefore not accessible for wheelchair users; however, the room is spacious and affords plenty of room for manoeuvre. Remote controls are provided for all TVs and stereos. 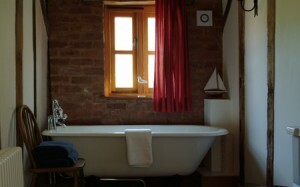 There is a shower stool and bath step at the house – please ask at time of booking. All showers and baths are fitted with grab rails. The floors are natural products and are uneven in places. 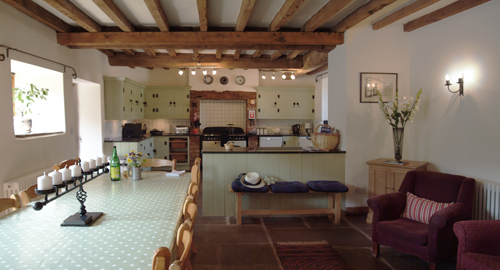 If you visit this part of Herefordshire, you will be taking a delightful step back in time! We would like to preserve this unspoilt countryside and would ask you to consider your impact on the immediate environment. Children and well behaved adults wecome! Up to two well behaved obedient dogs at the guest’s responsibility by arrangement (nominal charge applies). Smoking is not permitted in the property however ashtrays are provided outside for those so inclined. Recycling bins are provided for guest use. We aim to use environmentally friendly cleaning products and hand soap. We also provide an initial supply of the basic consumables (loo paper, washing-up liquid, logs, etc.). Further supplies can be purchased locally. We like to promote local producers and have provided a sample of local produces in our ‘Welcome Basket’. If you like them, buy locally before you depart! See also links in the local area page.